While hard to believe, in the not-so distant past burglar alarms required a traditional phone line for central station monitoring. Over the past couple decades or so, however, more and more homes count on cellular dialer monitoring for this service. As cell dialer technology improved, “interactive” cellular monitoring added even more security and convenience to alarm system use. Interactive cell dialers such as ours powered by Alarm.com put a lot of control and security at users’ fingertips. Alarm.com features include allowing users to control their alarm remotely with a smart phone app. The Alarm.com dialer also acts as a smart home hub. This allows homeowners to install smart home devices and control them using the same app. We’ve detailed many of these features in previous posts. Our post on Using Your Smart Phone to Add Security to Your Alarm provides some good ideas for getting started with these services. Our Important Security System Add-Ons for Your Smart Home also detailed several ideas for installing integrated smart devices. Over the past year or so, Alarm.com has added several new services to their security platform. 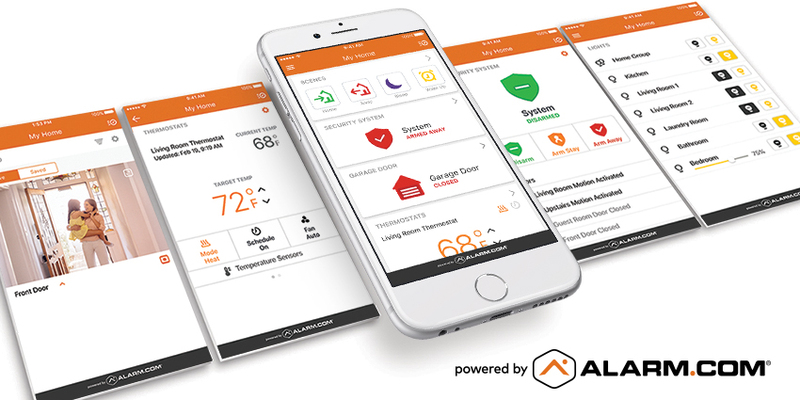 This post will examine the latest and greatest security and smart home features from Alarm.com. We’ll begin with a couple new security-minded functions. From there, we’ll look at a new Alarm.com offering focusing on convenience. Finally, we’ll take a look at some of the new “techy” Alarm.com features that help you keep others safe. Let’s begin with a feature that puts help at your fingertips at all times. Alarm.com users can activate a number of different types of panic signals from their cell phone. Panic buttons hold a very important place in the security industry. Many of our customers install these devices in their homes to allow for an instant alarm response to an emergency. Our post on Improving Senior Citizen Safety in the Home discusses the concept of both stationary and portable panic buttons. In that post, we focused on devices that could call for medical help when activated. 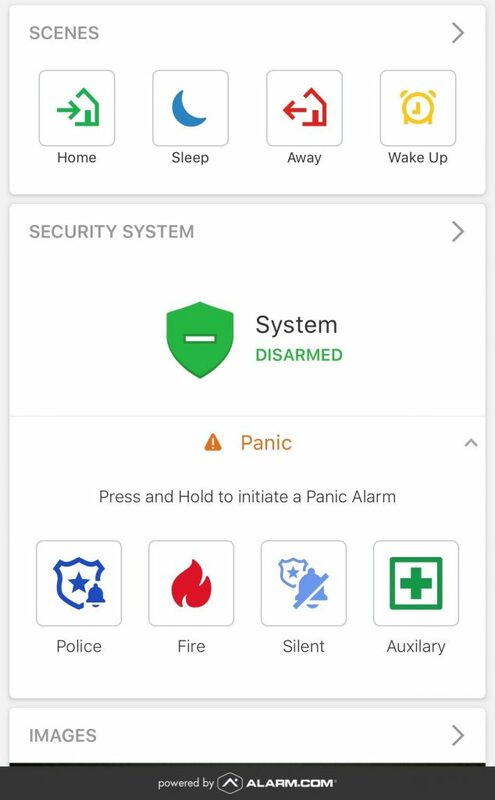 One of the most recent Alarm.com features allows users to use their cell phone to send a “panic” signal through their alarm system. This feature has many upsides over traditional panic buttons. For starters, standard panic buttons require users to pre-determine a response. While these buttons can activate a police, fire, or auxiliary response, we can only program them to create the one, pre-determined response upon activation. On the other hand, the Alarm.com panic interface (pictured) presents users with several options. Audible and silent alarm signals can be sent by anyone with access to a home’s alarm.com account. Additionally, residents can use this feature remotely. Wireless panic buttons generally only work within 500 feet or so of a home. An Alarm.com app’s panic buttons allow you to get authorities to your home quickly no matter your current location. Let’s look at another way the Alarm.com app allows you to send for help as quickly as possible. One of the newest Alarm.com features, “Smart Signal” has turned many heads in the industry. This feature allows homeowners to verify or cancel alarm signals in real time. The activation of an alarm creates a pop-up on a user’s phone with the pictured prompts. Clicking “Cancel Alarm” will decline a police response immediately. Conversely, clicking “Verify” leads to a phone call to the police that will have heightened priority. Because of how many alarm phone calls spring from false alarms, unverified alarms often create a “low-priority” police response. The ability to verify alarms in real time can lead to a quicker response from both the central station and the police. Now that we’ve looked at a couple new Alarm.com offerings that enhance security, let’s take a look at a feature that can add convenience to security system use. The ability to immediately verify or cancel an alarm can lead to a more efficient response to a potential emergency. Siri, Apple’s robotic, friendly helper, can also create a shortcut for activating alarm and smart home commands. To use this Alarm.com feature, you should begin by creating default “scenes” for different scenarios. For example, your “bedtime” scene may arm the perimeter contacts on your alarm system. It can also lock your doors, turn the home temperature down slightly, and turn out the lights. Your “awake” scene could turn lights back on and bump up the thermostat. You have complete control over what you call each scene and what activating a scene does to your alarm and smart home devices. Previously, you would activate each scene through your Alarm.com app. However, Alarm.com has recently added “Siri Shortcuts” to their scenes feature. Now you can set up a Siri voice command to activate any scene. This allows you to trigger scenes with a voice command both inside and outside of your house. Furthermore, this allows you to activate scenes during times that using your phone’s app would be unsafe. For example, during the drive to work you may remember your failure to arm your security system. Pulling our your phone and saying your custom scene activation (e.g. “Hey Siri I’m going to work”) will activate the scene that you’ve tied into that voice command. This addition makes one of the most convenient alarm platforms in the industry even easier to use. Let’s look at another interactive, recent Alarm.com offering. Alarm.com’s “Wellness Insights” allow you to ensure that the occupants in a household behave as expected. This can especially help when tracking an elderly family’s members movements to ensure consistent behavior. These insights begin with a 30-day activity tracking period to determine normal routines. Both security-related and smart home-related activity can help inform this tracking. For example, after a period of time it may be determined that a home’s alarm is usually set by 11pm. Additionally, Wellness Insights may find that someone usually turns the bedroom light on and turns the alarm off by 9am. If this doesn’t happen, you will receive an alert. Adding additional alarm sensors can help track even more important behaviors. Our post on Unconventional Uses for Contact Sensors discussed putting security contacts on medicine cabinets. Combining this tactic with Wellness Insights can help ensure that a home’s residents are taking their medication on time. Failing to open the medicine cabinet by the expected time will generate an alert. Conversely, opening the medicine cabinet door at unexpected times will also create an alert. The ability to track both unexpected actions and non-actions make this one of the most useful Alarm.com features for caring for elderly family members. Let’s look at a piece of smart home equipment that extends these features even further. 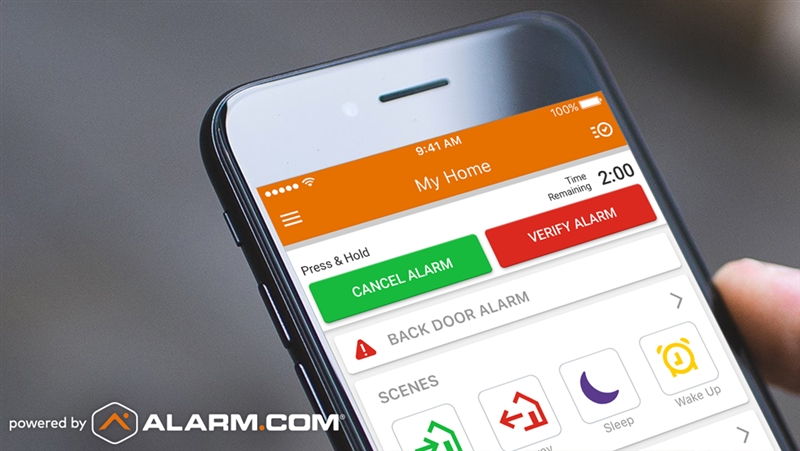 The Alarm.com Wellcam adds an abundance of security and safety features to your alarm system. 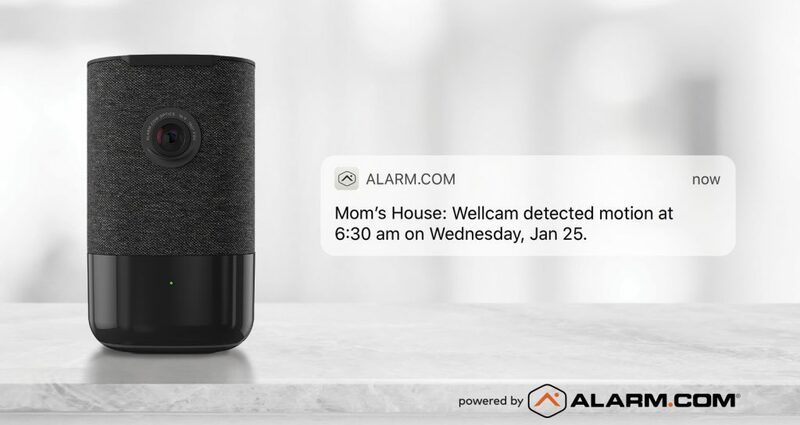 One of Alarm.com’s newest pieces of smart home equipment, the Wellcam provides a wealth of security features. For one, it integrates into an alarm system as a motion detector. Adding this device into areas of the home with windows or sliders can add security in case of a break-in. Furthermore, this device works with Alarm.com’s Wellness Insights to develop expected tendencies. Perhaps you expect a family member to make breakfast in the kitchen by a certain time. This sensor will create an alert if this fails to happen, regardless of whether or not your alarm is armed. Likewise, the Wellcam will also catch unexpected activity. Someone walking in front of a Wellcam in the wee hours of the night can also trigger an alert, if deemed an unusual event. This device also includes additional communication features that make it quite unique within the industry. For one, it provides constant two-way communication between residents of the home and an outside caretaker’s phone. If someone in the home needs to contact you, they can do so with the touch of a button. The phone conversation takes place over the Wellcam’s built-in speaker, so residents won’t need to find a phone number or hold a phone in the case of an emergency. Likewise, a button on your Alarm.com app initiates a call to the Wellcam, putting your voice through its speaker. Finally, this device also acts as a 180-degree camera that you can look through at any time. If you believe you have reason to worry, you can check in on a potential situation visually. This combination of security and caretaking functions make the Wellcam one of the most diverse security options on the market. We hope that you have found this rundown of new Alarm.com features informative. While it may surprise some people to hear, companies within the security industry offers a constant stream of exciting new products and services every year. Part of this stems from the fact that criminals constantly find more advanced methods to commit their crimes. The security industry must obviously keep up with what burglars can do. Furthermore, home and business owners have come to expect convenient, easy control over their home security products and appliances. Our industry has had to keep up with these expectations as well. If you have questions about any of the material in this post, we encourage you to contact us. Perhaps you have interactive cellular monitoring and wish to take advantage of new features. Or maybe you haven’t dipped your toe into the security or smart home world yet but want to get started. Either way, we provide free site surveys to help you incorporate these new services into your home security plan. Together we can decide how to best use new Alarm.com features and other security advances to help keep you, your most valuable possessions, and your family as secure as possible. How Do Burglars Defeat Alarm Systems?